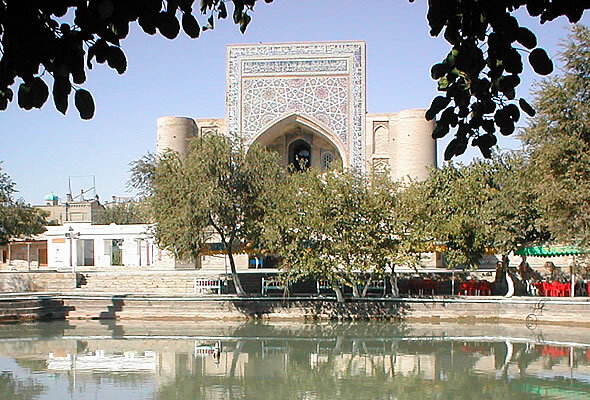 The Labi Hauz (at the pond) architectural ensemble is one of the busiest places in Bukhara. In the past, hauzs (reservoirs) were the main source of water supply. Therefore, each neighborhood had its own hauz. Due to hot weather, folks in Bukhara would seek cool, shady banks of reservoirs to escape from summer’s intolerable heat. In Uzbekistan, hauz is an artificial reservoir, where water is stored in case of water shortage in canals. In reservoirs, water gets settled so that it could be potable and suitable for food preparation. In cities, hauzs would take a monumental character. Their banks would be surrounded with massive stones. And the volume of ponds would reach 5,600 cubic meters. The Labi-Haus architectural ensemble comprises three monumental structures: the Kukeldash madrasa (1568), Nadir Devonbegi madrasa (1622) and Nadir Devanbegi khonaqo (1620). Khonaqo is a type of a hostel widely spread in the Muslim east. It includes a mosque and living rooms that mainly sheltered dervishes in the past. Since 1989, the Nodir Devonbegi khonaqo has been exhibiting and selling modern works of art by folk craftsmen and Bukharan artists of the 20th century. The exhibition includes products made by contemporary Bukharan jewelers, woodworkers, miniature-painters, Gijduvan ceramists, coppersmiths, and silk and gold embroiderers.